one, twee, drei, 3 covers in Europe!!!! We are thrilled to have ANOTHER cover of one of the world's finest design magazines. 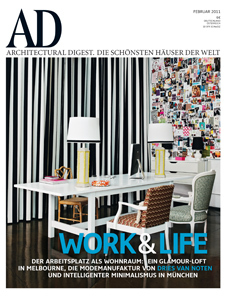 First living etc (UK) then Residence (Netherlands) and for February, Germany's Architectural Digest...what an amazing start to 2011! A huge thanks to all of our European supporters!! !